Are you involved with any of the production or raw materials or any other type of primary or secondary business? The impact of these business operations on machinery and assets are significantly high. Our industrial cleaning and waste management services can preserve the life of your assets and eliminate all contaminants and dirt from work sites. High Pressure Water Jetting – We remove grime and build up from large industrial machinery, unclog outlets and strip work areas of marks and resins, even with intricate equipment. 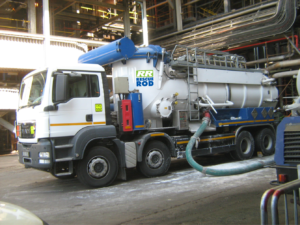 Vacuum Trucks – Dry and wet waste created by operations can be thoroughly cleaned out of work areas and disposed of. Septic Tank Drainage – Honeysuckers clean out and safely dispose of the contents of full tanks as well as sumps and grease traps, replacing decomposition bacteria. We perform these services fast and delicately so it doesn’t affect your business any more than absolutely necessary.